Home is a big thing. If you’re lucky, like I’ve been, home is a place you care about, with people who care about you. Losing home must be like losing a part of your own body. Losing home because of the violent acts of others is something almost unthinkably painful, and yet this may be the least of the suffering which forms the stark reality of millions of people in the world today. It is not something I find easy to think about. It is not something I really want to think about. Perhaps “Mankind cannot bear too much reality” after all. 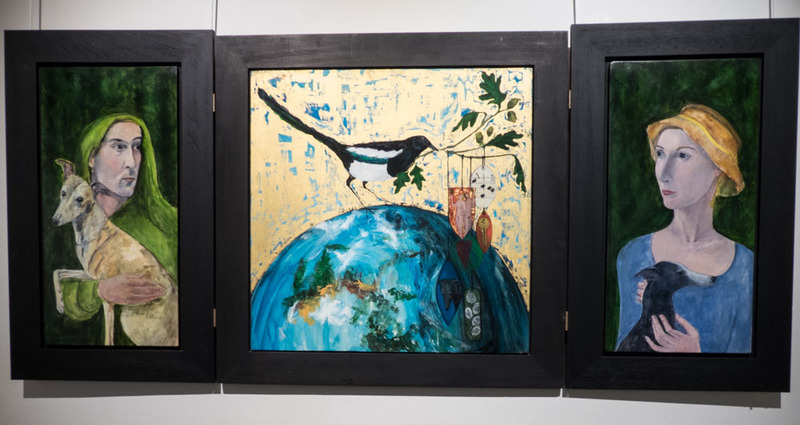 I think that an important role of the paintings in Christine McIver‘s exhibition “The Journey” is to bring the viewer to look again at images of migration, and to help us to think again about something that it might be easier to put out of mind. The exhibition at the Dunblane Museum is quite small – only a dozen or so works in all, but several of these are unusually long images of a panoramic aspect ratio. Christine’s subject is migration. She shows us shadowy tides of humanity drifting by the perimeters of our world in the liminal light of the edge of day. These long journey-friezes, resembling lost scrolls rendered on archeologically fragile rice paper, are at first vaguenesses of crowds. But as the eye lingers on interesting textures, and shadows of movement, individual moments of story become visible, lagging children are gathered up, pained backs hunched inward, bone-weary people prop each other up. It’s necessary to work to visualise the details, and that requirement is part of the skill of these paintings. The eye wants to engage, and the mind needs-must follows, even if into territory that we might rather not consider. Let me be upfront about how I feel about faith. Although I’m an avowed atheist (I have been reliably told it’s a pity I’ll be going to Hell before now), I’m not a Richard-Dawkins-hang-’em-high kind of an atheist. I do have major concerns about what religious belief can do to people when it goes awry – and, Jings! it often does. Faith aggravated conflict seems itself be a significant contributing factor to the causes of so much contemporary migration. However, that doesn’t mean that I have no respect for the beliefs of the many people of faith who I know to be remarkable, generous, and plain-honest-to-goodness sound individuals. Having said all of which, I feel that faith is very present in this work. The titles of some of the works like ‘Exodus’ and ‘To the river’ point the way to biblical references, and the show has a strong feel of the drive of Witness about it. My point is that these works – which are neither derivative nor preachy – are empowered by this drive. We do tend to fall back on biblical metaphors when presented with a sufficiently catastrophic mass of human suffering. But I do not think this is what is happening here. Rather it seems to me that faith, perhaps metaphorically informed by biblical narratives, is a core part of the artist’s psyche. It would have been disingenuous not to allow this to be present into these paintings. This provoking show was two years in the making. It has already sold well, and this forms part of the artist’s intention to generate action as well as empathy, as proceeds are being passed on to refugee charities. The images shown here are frustratingly small – I think it is important to meet these paintings face-to-face. When I did I felt engaged, and compelled to think and question in several uncomfortable directions at once. Where next? I am not sure. The Journey by Christine McIver is at the Dunblane Museum until May 29th 2017, admission is free. 52: a bucketful of permission…? Review: ‘The Very Best of 52’ Edited by Jonathan Davidson, Jo Bell & Norman Hadley. Nine Arches Press, July 2015. I have a confession to make when it comes to poetry … I’m a bit of a slow reader. Generally collections of poetry aren’t that long, but it usually takes me quite a while to work through a whole book of poems. I tend to dip in and manage to read one or two poems at best and then need to stop for a while. The Meffan in Forfar is a great wee gallery, they regularly have excellent and engaging shows of work by contemporary artists. 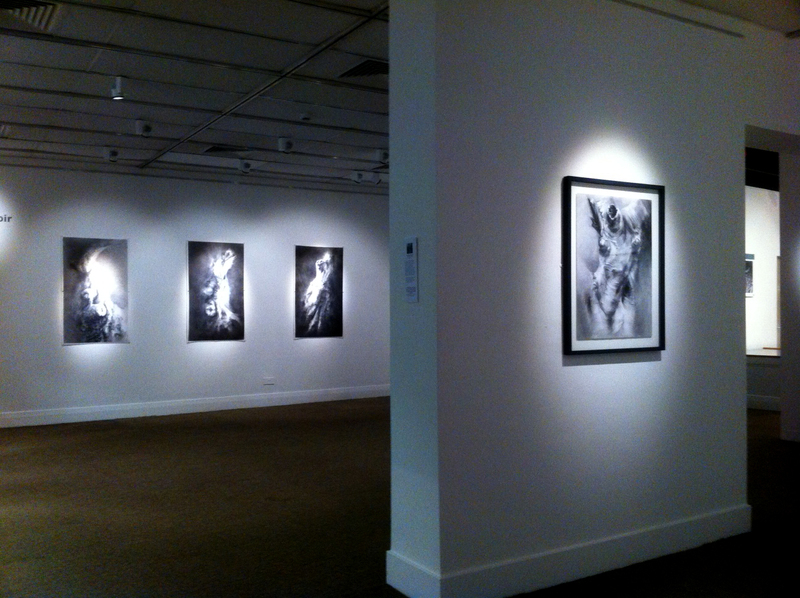 Tansy Lee Moir’s current exhibition “Time around trees” however, is something very special. This is the work of an artist who coming into her own, bringing many strands of past experience and interests together with convincing skill. 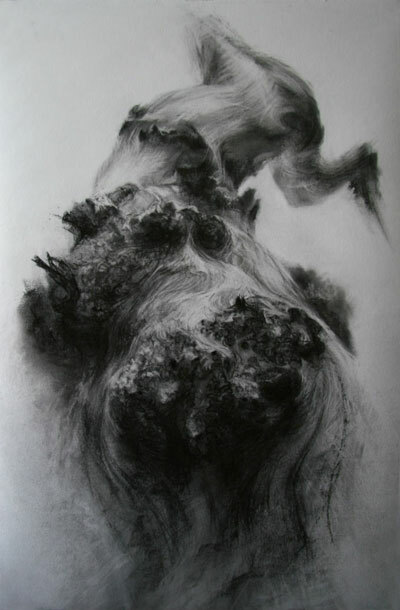 Trees become passionate presences in Tansy Lee Moir’s drawings as she combines nature, sculpture and dance to deliver striking renderings of the arboreal made corporeal. Some works are reminiscent of the sinews of dancers moving under fabric, others suggest the passage of an alternative measure of time, where trees are revealed dynamic and alive with tension and force: powerful creatures in fluid motion. Tree as living body, tree as river, tree as dramatic costume, tree as palimpsest. Yes, I do love trees, and for a long time I have tried to photograph what it was that fascinates me about them. I found much of that brought into clear focus here – and executed with that apparently enviable ease which can only be the product of long and sustained effort made good. And made better by a well planned collection, well lit, and well shown – so congratulations are due to those involved in every area. If you love trees, or dance, or water (think Derges ‘Liquid From’), or sculpture, or draftsmanship, you should see this show. Quite simply – unmissable. “Time around trees” by Tansy Lee Moir is at the Meffan in Forfar until 1st November 2014.